I've adored Josh Sessoms' work for years now, and his latest drawings have gotten even more mind-blowing. Many of his pieces are vibrant and meticulously detailed homages to African deities, from Egyptian gods to Vodun loas. He writes of the above colored pencil masterpiece, "Damballah is a Vodun Loa of the primordial cosmic mind - both collective and individual. Damballah takes the form of the serpent and is associated with creation, vast primeval waters and rain." It's speaking to me especially now, at the turn of the year, as we all prepare to shed our skins and slither into our own new creative forms. If this message connects to you, too, I highly recommend listening to "Dambala" from Exuma's exceptional 1970 self-titled album, and/or Nina Simone's powerful cover. Here's wishing you a blessed shape-shifting for 2018. I've been wanting to write about Helen Adam for some time, after falling in love with her delightfully warped collages at the "An Opening of the Field" show at NYU a few years back. She was a Scottish poet and prodigy, having published three books of ballads by the age of twenty. She then moved to San Francisco with her mother and sister Pat, after a freak golf accident killed her father. Fortunately, she eventually fell in with Robert Duncan, Jess, and their group of visionary (and ultimately legendary) writers and artists in the 1950s. Adam would perform her witchly writings in the style of a balladeer, singing and rocking in incantatory fashion (there are a few marvelous videos of this here and here), and by all accounts enchanting the SF poetry literati of the day. 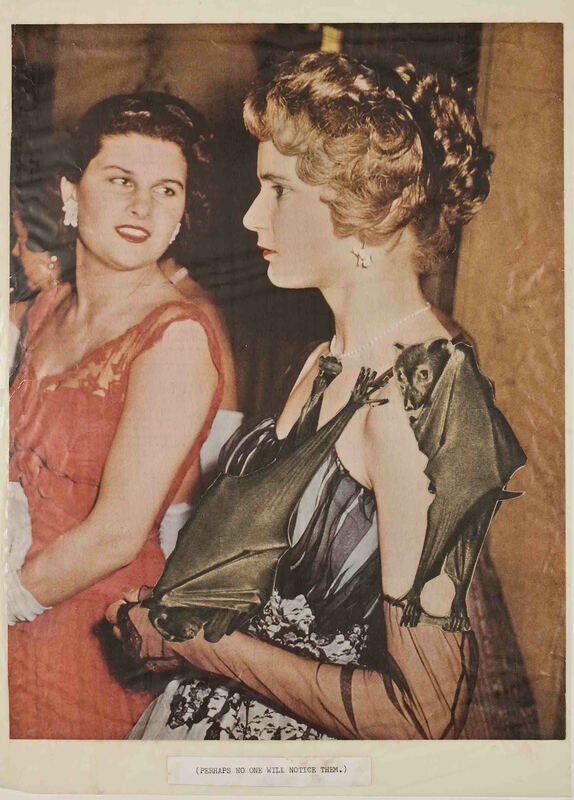 Her collages came later, and juxtaposed pictures of benign fashionable ladies with insects, monsters, and other creatures of the night (her bat-covered lady piece captioned "Perhaps no one will notice them" is a favorite.) Eventually she created a book entitled "In Harpy Land," (you can scroll through the link to see several pages) which combines collage and poetry to tell the tale of a world controlled by dark, magical women. It recalls Max Ernst's surrealistic visual novels such as Une Semaine de Bonte, though Adam's story is far more matriarchal. Sadly, Adam died impoverished and ill as a ward of New York State in 1993, and many people still don't know of her work. A few devoted folks are looking to remedy that, including Kristen Prevallet, whose writing about her is both extensive and beautifully sensitive, culminating in the book "A Helen Adam Reader." And in more happy news, Further Other Book Works is about to release the monograph, "The Collages of Helen Adam," which looks as though it can be pre-ordered as part of this bundle. Here's hoping this bewitching bard finally gets her due.